Info From her first days tagging along with her father, Ted, in Wooster Square to standing up for her beliefs in Congress, one thing has never changed about Rosa DeLauro – she cares about people. To really know Rosa, you have to know her family. Her father, Ted, came to America when he was 13, speaking no English. Rosa’s mother, Luisa, was raised by Rosa’s grandmother, who was widowed with six children in 1918, and supported the family by running a pastry shop, Canestri’s, in New Haven's Wooster Square. From early on, Rosa’s parents stressed the importance of hard work, compassion for others, and getting a quality education. After learning these early values at home, Rosa attended the Academy of Our Lady of Mercy. She earned degrees from Marymount College and Columbia University and studied at the London School of Economics Although her degrees are in political science, her real education came from her father, Ted, an old-school politician, who made it his business to know every family in the ward. To him, politics was about helping people. Soon after college, Rosa followed her parents’ footsteps into public service. 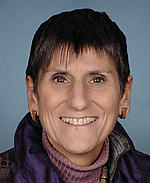 In 1990, she was elected to Congress and has since become one of the hardest working members. She has helped improve schools, bring tax relief to middle-class families, protect employee pensions, and encourage job creation in Connecticut. Just like the lessons she learned when she was young, for Rosa, politics will always be about helping people. 08/11/2020 CT District 03 - D Primary ??? CT Governor - D Primary - Aug 08, 2006 D John DeStefano Jr.